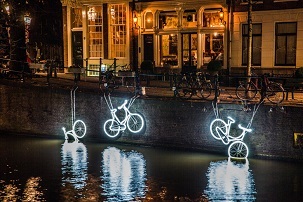 Amsterdam Light Festival private cruise..
Must do: Amsterdam light festival private cruise in wintertime! If you are staying in Amsterdam between 29th of November 2018 till 20 January 2019 you need to add the Amsterdam Light Festival to your bucketlist! During this period there are 30+ light artworks spread throughout the city center, and they tell a unique story…. All lights are located on the water and are (the best) viewable by boat. Therefor we made some unique private canal cruise packages. At ZOYO Travel we are specialized in private tailor-made experiences; for the Amsterdam Light Festival we designed a couple of unique features to give our clients ‘the best’ experience only. Unique old boats with various sizes (depends on your group). From 2 till 30+ persons, we will suggest the right size for your group and ‘cozy’ feeling. Most boats have an outside- and inside (heated) area to have the best possible experiences. This is a unique experience ‘open’ experience. You will certainly see the ‘most’ of everything that happens all around you. But it could be a little bit colder and there is no heating: a true ‘real’ experience of Amsterdam. We use a regular canal cruise boat for the ‘regular’ tourists. Most boats offer 95 % indoor seating and 5 % outdoor (standing area) – less unique/cozy experience but certainly a good option for bigger groups +30 persons. Make a regular ‘cruise’ with some drinks and a light snack. Take your private cruise to the next lever and make it an exclusive dinner cruise. Add a wine tasting by one of our sommeliers for a ‘business class’ wine & cheese tasting. We offer many options and it is up to you. We are ready to give you some personalized options. Tell us your hotel and we can arrange a boat docking at your hotel or close-by. Add one of our luxury taxi transfers from your hotel to boat location. Make it a full day with some unique tours and experiences in the center of Amsterdam. We are looking forward to assist you during your next stay!